Shamrock earrings petite studs that are cast in 10K gold. These shamrock earrings have been hallmarked 10K gold by the Irish Assay Office at Dublin Castle in Ireland. These small 10K yellow gold shamrock stud earrings measure 5/16" wide x 5/16" tall to the top of the posts and have semi dimensional rounded leaves along with push on butterfly backs. The stud earrings are made by O'Connor Jewelry in Dublin, Ireland and are gift boxed with a shamrock history card, complements of The Irish Gift House. Gold shamrock earrings are tiny studs for adults that are cast in 10K. Gold shamrock earrings are small studs for adults that are cast in 14K. Gold shamrock studs are tiny earrings for adults that are cast in 14K gold and are accented with a CZ stone in the centers. 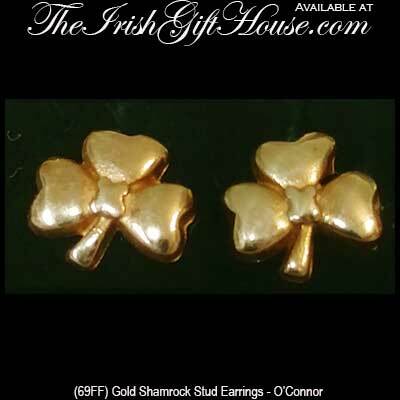 Shamrock stud earrings are a small design that is cast in 10K gold.